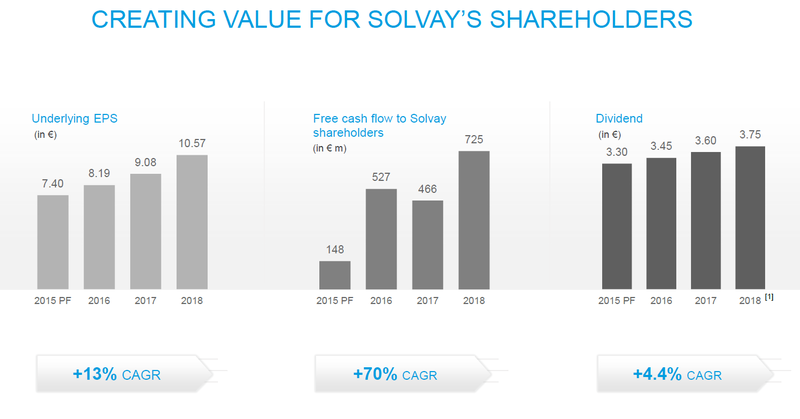 Solvay performed very well in 2018 and continues to generate quite a bit of free cash flow. The sale of the polyamides business should close in H2 2019, resulting in a net cash inflow of 1.1B EUR and getting rid of 0.5B EUR in net debt. The only remaining issue I have is the pension deficit, but apart from that, you should have a look at Solvay as a buy-and-hold position. With a full-year (underlying!) EBITDA of 2.23B EUR and a Q4 EBITDA of 506M EUR, Solvay can be very happy as, especially, the Q4 results were a relief, considering Solvay was able to charge its customers higher prices to keep the margins stable. So, while the underlying performance remains strong, the reported results are a bit weaker. The total revenue increased by almost 3% to 11.3B EUR, but the gross income decreased by 2% to 3.04B EUR. Fortunately, Solvay appeared to have been very good at cutting costs: the commercial and administrative expenses decreased by, respectively, 6% and 3%, and despite higher expenses related to portfolio management and litigation provisions, the EBIT actually increased by 1% to 986M EUR. On top of that, Solvay is now really benefiting from the low-yield environment after repurchasing some of its bond in 2017. The net interest expenses decreased from 157M EUR to just 118M EUR, and this resulted in a pre-tax income of 791M EUR, up 17% from the 678M EUR in FY 2017. That being said, the net income did fall as Solvay recorded a tax benefit in 2017 and a (small) tax payment in FY 2018. The net income came in at 897M EUR, but this includes a net income of 201M EUR from the polyamides business, which is in the process of being sold to BASF for 1.6B EUR, so the net income from continuing operations was approximately 697M EUR or 6.34 EUR per share. Keep in mind the sale of the polyamides division hasn't been completed yet, and once it closes, Solvay is expecting a net cash inflow of 1.1B EUR, which will have a positive impact on the net debt and the company's enterprise value and will also reduce the EPS to around 6.25-6.50 EUR. But, of course, the net income could differ from the cash flow results, which determines Solvay's ability to repay debt and pay dividends. Solvay's reported operating cash flow was approximately 1.72B EUR, but this includes a 148M EUR investment in its working capital position, while it also includes a 60M EUR higher tax payment than what would have been due based on the pre-tax income in FY 2018. That being said, we still need to deduct the 114M EUR in interest payments and the 111M EUR paid on hybrid bonds. 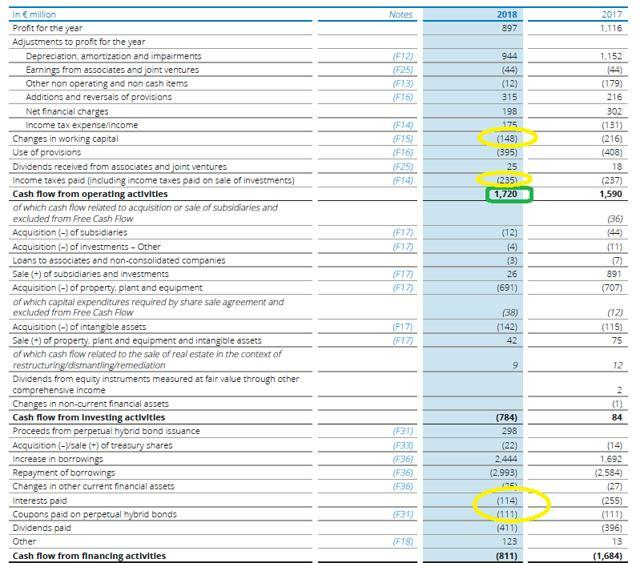 After including these adjustments in the cash flow statements, the adjusted operating cash flow doesn't change that much (to 1.703B EUR), but at least, this does provide a better overview of the cash flow performance of the underlying business. The total capex was just 833M EUR, which results in an adjusted free cash flow result of 870M EUR, or 8.38 EUR per share, which makes Solvay very reasonably priced at the current levels as this represents a free cash flow yield of approximately 8%. That being said, we should also keep in mind Solvay will 'lose' the free cash flow from the polyamides business it's selling to BASF. Solvay did a good job in being transparent as it provided the separate cash flow result of the business that's being sold. According to an additional note to the financial statements, the polyamides business generated 120M EUR in free cash flow, although the details (working capital changes, taxes,…) remain unclear. So, on an adjusted basis, excluding the polyamides business, Solvay will still generate 750M EUR in free cash flow and perhaps a bit more as it could use the net proceeds to pay down debt and reduce the interest expenses on the remaining debt. And, using 750M EUR as adjusted free cash flow would still represent an FCF/share of in excess of 7 EUR, indicating the free cash flow yield will remain north of 7%, while Solvay becomes a safer company due to the lower debt level. Solvay is selling the polyamides business for an enterprise value of 1.6B EUR, which includes 500M EUR in existing debt. This basically means the gross cash position will increase from 1.1B EUR to 2.7B EUR, while the gross debt on the balance sheet level will remain unchanged at 3.8B EUR (considering the debt attributable to the polyamides business is very likely located on the level of the parent entity as the polyamides subsidiary paid just 1M EUR in financial expenses). This means the net debt position of Solvay will decrease to just 1.1B EUR, which should have a positive impact on the debt ratio as well, although it remains unclear how hard the EBITDA result will be impacted by the sale of the polyamides division. Solvay only provided an EBIT (288M EUR), but no EBITDA result. 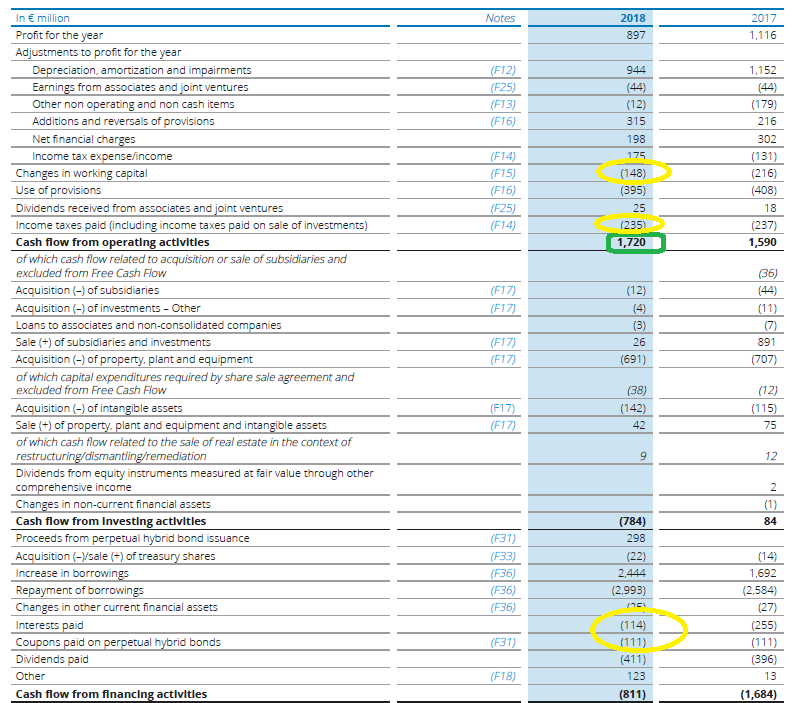 If I would assume the 120M EUR in capex spent in the polyamides division, I think it's fair to assume the division generated approximately 425M EUR in EBITDA. If I would deduct that from the underlying EBITDA of 2.23B EUR, Solvay would still generate 1.8B EUR in EBITDA after selling the polyamides division, resulting in a debt ratio of just 0.5. That's great, but we also shouldn't forget about the pension deficit on the balance sheet. As of the end of 2018, this deficit totaled 2.67B EUR. Down 5% compared to the previous year, but almost 3B EUR still is a big gap, and I hope Solvay will do the right thing and spend some of the incoming cash on plugging the hole. Including the pension deficit, the approximate debt ratio would be around 2. I have a long position in Solvay after seeing how the company's share price dipped below the 90 EUR mark during the general correction on the markets in December of last year, but I wish I had bought more. Looking at the free cash flow result, even after removing the free cash flow from the polyamides business that will be sold this year, Solvay remains attractively priced, and I will be looking to add to my position on weakness. Disclosure: I am/we are long SVYSF, BASFY. I wrote this article myself, and it expresses my own opinions. I am not receiving compensation for it (other than from Seeking Alpha). 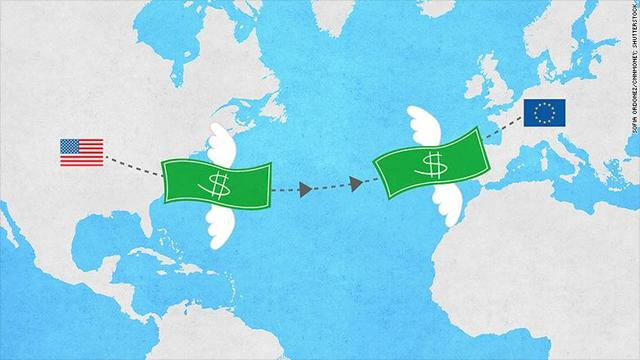 I have no business relationship with any company whose stock is mentioned in this article.